While you might not like that Christmas decor shows up earlier and earlier in the year, when it comes to making extra money for the holidays, the sooner you start the better. The truth is, as fall turns cooler, people recognize that the holidays are around the corner and start making plans. This makes the holidays an ideal time to make extra money or start a new career from home, since people are buying and need help at this busy time. 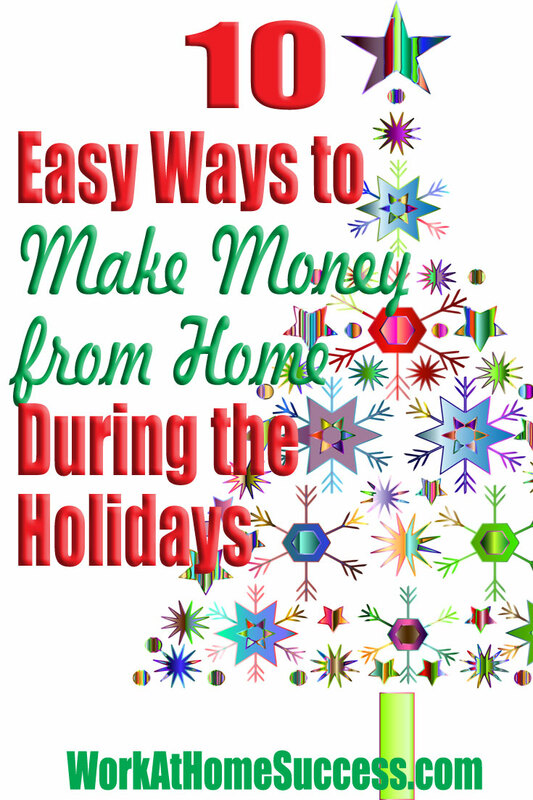 Here are 10 ideas to make and save money from home during the holidays. 1) Clean the Clutter and Sell Your Stuff. Holidays often mean guests, which means cleaning and decluttering your home. Why not make money from the unused and unwanted items you find as you clean? There are may websites that will pay for your used books, clothing, electronics, accessories and more. A great option that handles the hassle of packing and shipping for you is Fulfillment by Amazon. Simply list your items for sale and ship them all to Amazon. When they sale, Amazon will take care of packing and shipping them to customers for you. To learn more, check out WAHS’s article on How to Make Money with Fulfillment by Amazon. Also, check out Jessica Larrew’s free 7 Day Email Course: Everything You Need to Know to Start Selling on Amazon. Here are a few survey companies for those of you who live outside the U.S. Check out WAHS’s article on How to Make Money with Surveys for more information and survey resources. Many companies are hiring extra help with customer service and order taking during the holidays. Many are flexible and part-time, allowing you to work around your current job or other commitments. If you do well, you might be able to turn a temp customer service job into something more permanent in the new year. For more information, check out Seasonal Work At Home Customer Service Jobs plus 9 companies that hire seasonal customer service agents. People are looking for unique items to buy as gifts for the holidays. GearLaunch offers a great way to create your own items (clothing, mugs, totes, etc) and sell them online without the tech know-how or expense in setting up an online store. It offers a turn-key, easy to use system that will dropship your creations to customers. And it’s free. You can sign up for GearLaunch here or check out WAHS article Set Up A Dropship Online Store Fast and Easy. 5) Start a Holiday Related Business. Holiday Craft and/or Gift Baskets – A great place to sell your items, besides local holiday craft fairs, is on Etsy. The holidays is a big time of year for shopping. You can get paid for it in several ways. One option is to be a personal shopper. You can check out Safeway, Instacart and Shipt for openings. Another option is to mystery shop, where you get paid to research stores and restaurants. A few places to check out include About Face, A Closer Look, and Call Center QA. You can learn more about mystery shopping and get more companies by checking out WAHS article Get Paid to Shop. Ebates – I especially like Ebates since it now offers in-store earning options as well as online earning. Be sure to check out WAHS’s articles, Make and Save Money on Everyday Tasks and 58 Smartphone Apps that Pay for more resources that help you save or make money. There are several ways to use your car from taxing people around to advertising on your vehicle. Check out this article on 8 Places that Will Pay You to Use Your Car. Also, Amazon is paying drivers $18-$25 per hour in its delivery program.